The original impetus for attempting some record of the Far East PoWs of 211 Squadron came after seeing the late Anthea Beckett’s on-line Java Index: British & Commonwealth Prisoners of War Held in Java 1942-1945. Anthea compiled her extensive roll from a range of sources, including the Commonwealth War Graves Commission. Ever a gracious lady, she later suspended her activities and her site finally went off-line in December 2007. A version remains on-line at Ron Taylor’s FEPoW Community site. Meanwhile, Les & Pam Stubbs had published Unsung Heroes of the Royal Air Force: The Far East Prisoners of War in 2002, later kindly brought to my attention by Adrian Fryatt (son of 211 Squadron Armourer the late Jim Fryatt) following correspondence with George Money (ex-84 Squadron). Garnered carefully from a range of official and other sources over some years, the Unsung Heroes roll is an all but complete list of the 6,000 or so RAF personnel held captive in the Far East. Sadly, the state of the source material was such that, for many men, there was no record of their unit, while details of places held may be incomplete for a variety of reasons. These difficulties are set out in the Stubbs’ book. I have been able to make free use of their most valuable compilation thanks to the kind permission of Pam Stubbs. I must also thank Elizabeth Kaegi in Canada (and the Commonwealth War Graves Commission) for casualty listings for the Squadron extracted from CWGC records. With some further work, it has now been possible to bring these various records together, the result being the two rolls of known 211 Squadron FEPoWs, shown below. Many of the men shown in these rolls also appear on the 72 OTU roll of airmen posted to the re-forming Squadron in December 1941. In the Far East From 1942 until 1945, at least 364 personnel of 211 Squadron were held as prisoners of war by the Imperial Japanese Army. Of the 346 airmen known to have fallen captive on Java in March 1942, all bar five were groundcrew. All 18 men captured in 1944 and 1945 were aircrew, on operations over Burma. None of the available sources is without imperfection. The rolls below may therefore be incomplete and may contain errors. Perhaps readers will forgive such blemishes. The sad facts are that the many thousands of Far East Prisoners of War taken captive by the Japanese were held under appalling conditions of deprivation, to be used as slave labour and treated with savage brutality. Thus it was that, between 1942 and 1945, at least 186 members of the Squadron (8 aircrew and 178 groundcrew) died while PoWs in Japanese hands: just over half the Squadron members captured in the Far East. In total, far more than all the Squadron’s aircrew killed in action during five years of armed conflict. No less than 51 of them died while aboard Japanese vessels transporting them for forced labour. While the Squadron Honour Roll includes the last resting place or memorial for these men, the roll below records the places of their captivity and of their death, as far as currently known. Links to individual pages or shorter passages are shown in the usual way. Java, Singapore, Borneo (Jesselton, Sandakan). A roll of the 178 known 211 Squadron FEPoW survivors of the air campaigns of 1942 (Netherlands East Indies) and 1944 and 1945 (Burma), showing the places of their captivity (as far as now known). Links to individual pages or shorter passages are shown in the usual way. For some few others, brief notes of their service are in the Remarks column. Born in 1920, ex-211 Halton-trained Fitter/Armourer Eric Stanley Johnston had joined the RAF in 1936. By September 1941 he had been made Flight Sergeant in his trade. Posting to the Middle East followed in November. There he joined 211 Squadron in January 1942, as they were working up for their move to the Far East and war with Japan. He was among the 346 men of 211 Squadron known to have been taken captive at the fall of Java in March 1942. In April 1943, 2,070 mainly RAF personnel were paraded at Jaarmarkt Camp in Sourabaya, Java, destined for Pelauw on Haruku Is to build an airstrip. 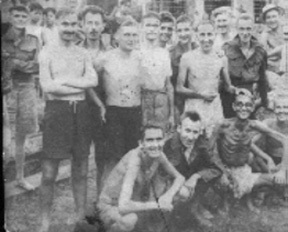 The conditions endured by the PoWs either in transit, on Haruku or later on Ambon were such that few survived. Johnny Johnston and Len Abbs were two of them. Johnny’s daughter Amanda kindly offered this stark photograph of some of the survivors. Johnny Johnston is standing in the 2nd row, 3rd from the left, arms at his sides. Repatriated to the UK, Johnston remained in the RAF until 1950 before returning to civilian life, his own business, marriage and parenthood. Eric Stanley “Johnny” Johnston died in 1989 some six months before his 70th birthday. Amanda’s biography of her late father is recorded in the since-archived BBC People’s War collection. Her accounts of the conditions endured by FEPoWs on Haruku and Ambon are to be found on COFEPOW site. Ray or Dai Williams had joined the RAF pre-war, in 1938 from his service number. Certainly with 211 Squadron in December 1941 if not before, Corporal Williams was listed on the 72 OTU roll of groundcrew departing Wadi Gazouza to reform the Squadron at Helwan for the January 1942 movement to the Far East. On Java in March 1942, Dai was one of a party of six 211 Squadron Sergeants who attempted to escape from Java from Parigi, some 12 miles west of Tjilatjap. The sea conditions along the South coast of Java defeated them. 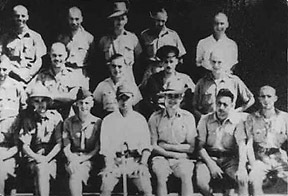 By courtesy of his niece Sian, this photograph shows the late Dai Williams (centre, middle row), while a PoW at Cycle Camp on Java in 1942. Held captive in the Moluccas at Haruku and Ambon, and in the Celebes at Muna and Makassar, Dai was one of those involved in a very late movement by sea to Makassar in July 1945. He survived. Some of his story is recorded in Prisoners in Java, the collected stories of the Java FEPoW 1942 Club. Raymond Lewis "Dai" Williams passed away in July 2001. There is a considerable body of published writing on this dark and difficult subject. The partial list below is of mainly personal accounts. Two or three of them relate to, or include, 211 Squadron men. Founded in 1997, the COFEPOW charity also does a great deal of valuable work in this field. Their website includes a Research Database, an extensive Books list, and a number of other personal accounts.